Arnold Schwarzenegger has finally achieved his lifelong dream. No, it's not becoming a champion weight lifter/action hero/governator. It's his dream of owning his own "f–king tank." Since it's only natural for a man who has been blowing things up since 1979 to want to pulverize things with his new toy, he's inviting you and a friend to join him. 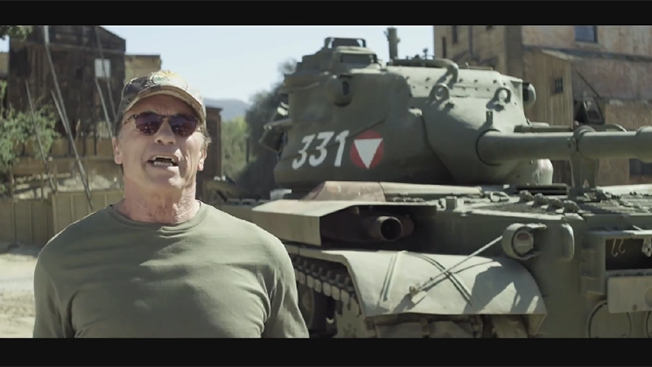 In an effort to raise money for the After-School All-Stars program, the Terminator has created an instantly viral video offering you the opportunity to "come to L.A. and crush things in my tank!" Crush anything you want: pianos, taxis, bubble wrap. Hell, he'll even crush movies that make you cry. Wait, does Terminator 3 count?